I would characterize this pattern as more stretch glass than Carnival, though they are often found in Carnival Glass auctions. 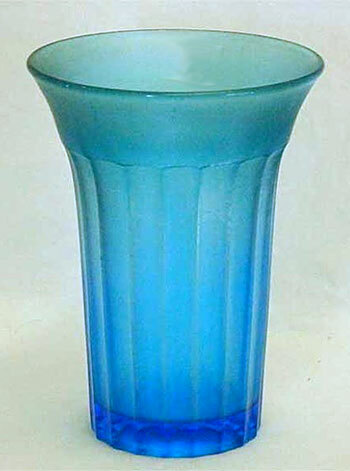 This celeste blue tumbler, for instance, sold for $40 at a Seeck online auction in 2014. The pattern is usually attributed to Diamond Glass. 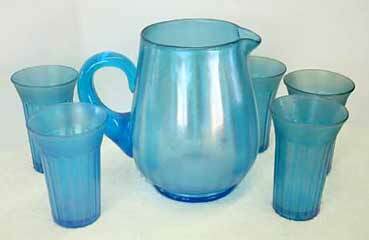 Tumblers, whether celeste blue, ice green, or vaseline, tend to sell in the $30 to $50 range. In 2015, a marigold water pitcher with enameled decoration sold for $130. This set, with a pitcher that did not have the usual lid, brought $125 in 2006. Photo courtesy of Seeck Auctions.